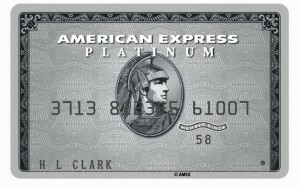 I recently found out about the American Express Platinum Card and all the perks associated with it. Considering the $450 annual fee, they had to be pretty substantial for me to sign up. Here is a list, as well as links to sign up for each feature if you already have the card. 25,000 bonus Membership Rewards points after spending $1000 in the first three months using this link. You may need to log out of your Amex account and clear your cookies first. These points can be transferred to airlines such as Delta, Continental, British Airways, Virgin, Airtran, JetBlue, Frontier, Air France, KLM, Hawaiian, ANA, and Singapore. $200 airline fee credit - any time you are charged a fee whether for baggage, itinerary change, or standby fee on the airline of your choice, American Express will reimburse you up to $200. Starwood Preferred Guest Gold status - 50% points bonus, late checkout, room upgrades. National Emerald status - enroll for free selection from Executive Level vehicles at mid-size sedan rates. Free international companion ticket when you buy First class or Business class through AMEX. Free Purchase Protection, Return Protection, Extended Warranty. This is mainly for those that travel frequently, as you can judge from the benefits. Also it is a charge card, so you must pay the balance in full each month.